North Adelaide is a thriving commercial, cultural and residential neighbourhood, located north of the River Torrens, within the City of Adelaide boundaries. 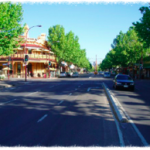 The suburb, with its rich historical, social, architectural and cultural heritage, comprises two main commercial hubs, centred around O’Connell Street and Melbourne Street respectively. Each street has its own unique character and blend of retail, hospitality and professional services providers, as well as well-established and vibrant residential communities.